If you know a little about a dinosaur’s footprint, you can use some math to learn much more about the dinosaur’s size and speed. Try some of the examples here, based on real dinosaur data. 1. Among the longest dinosaurs was Ultrasaurus. If an Ultrasaurus footprint was 3.1 meters long, what were its hip height and its head-to-tail length? 2. One of the smallest dinosaurs was Compsognathus. It was only about 76 centimeters from head to tail when it was fully grown. What would be the length of its footprint? 3. One of the fastest dinosaurs was Gallimimus. When it reached its running speed of 35 miles per hour, do you think its stride length divided by its hip height would be less than 2.0, between 2.0 and 2.9, or greater than 2.9? if it slowed down to walk, would its stride length become shorter or longer? 4. The Microceratops was the smallest horned dinosaur, only 76 centimeters long. If its hip height was 30 centimeters, and it was traveling with a stride length of 46 centimeters, was it walking, trotting, or running? 5. If the Velociraptor footprint you find is 18 centimeters long, what is its hip height? 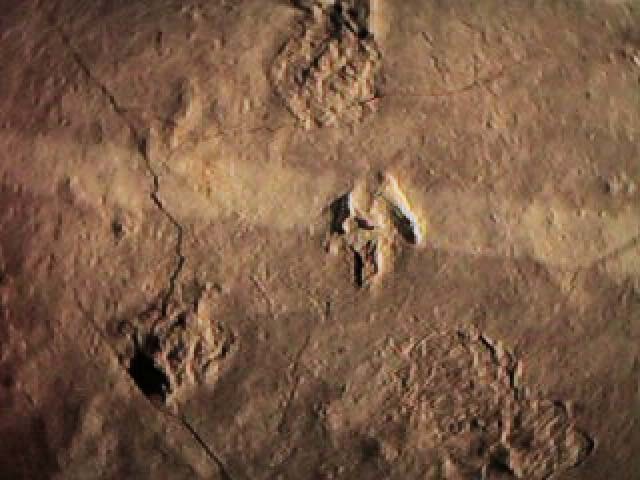 If the footprints are in a trackway where you measure the stride length to be 250 centimeters, was the Velociraptor walking, trotting, or running? 6. The footprint of an Acrocanthosaurus from Glen Rose, Texas was discovered, and measured at 51 centimeters long. What was the head-to-tail length? What else do you need to know to find out about how fast it was moving? Check your answers by hovering your mouse over the prints.